Teatime at WMODA is always a special occasion. 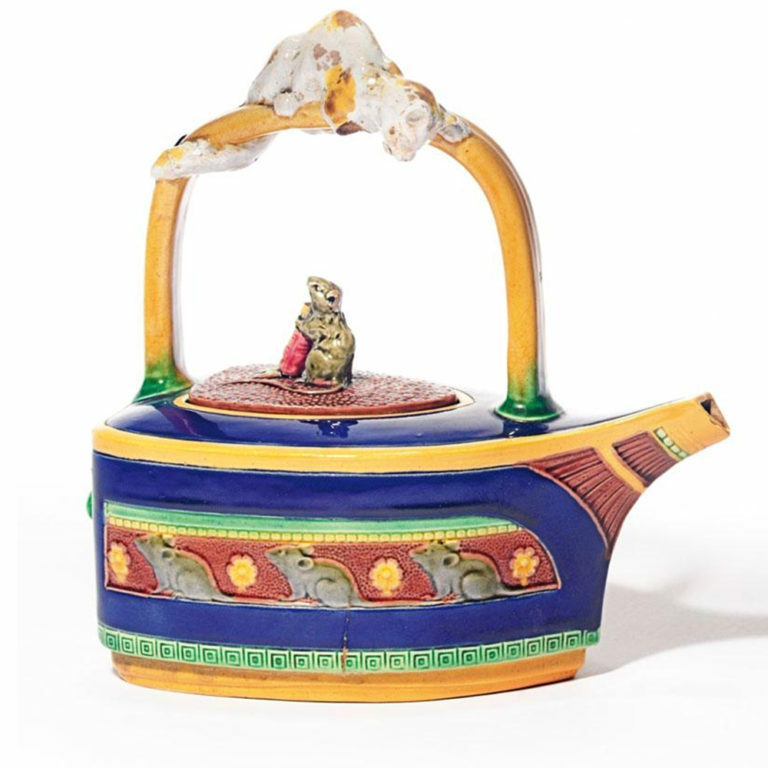 Discover more about the history of tea drinking from China to the USA in our popular Art of Tea exhibition. 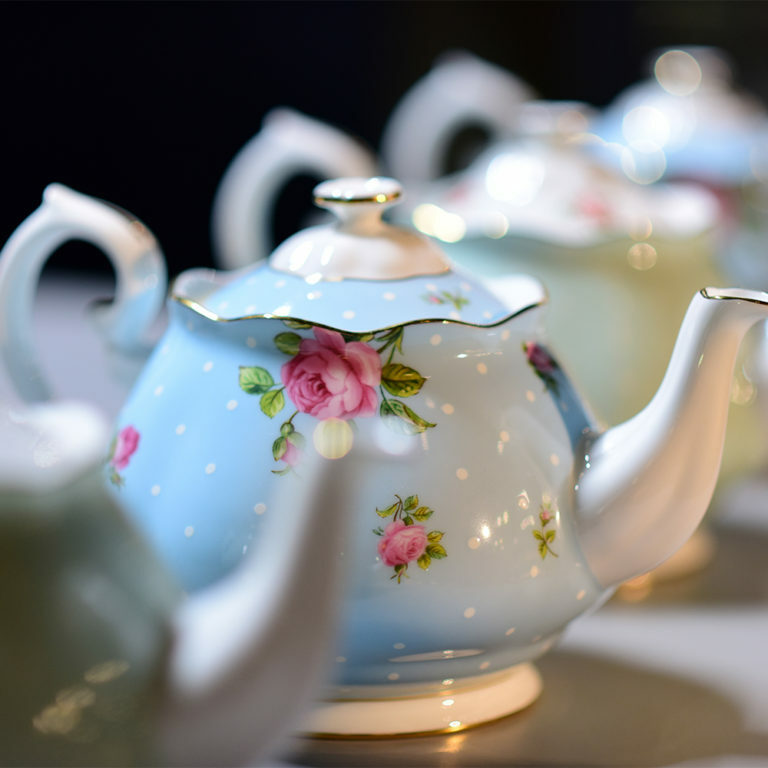 Louise Irvine, our Executive Director, shares anecdotes and etiquette tips for enjoying traditional English afternoon tea. 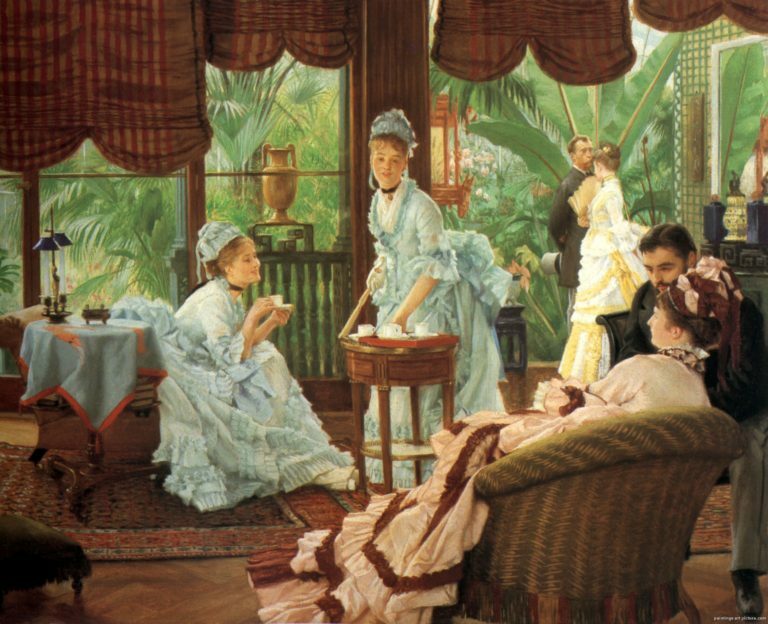 The ritual of English afternoon tea became popular during Queen Victoria’s reign. 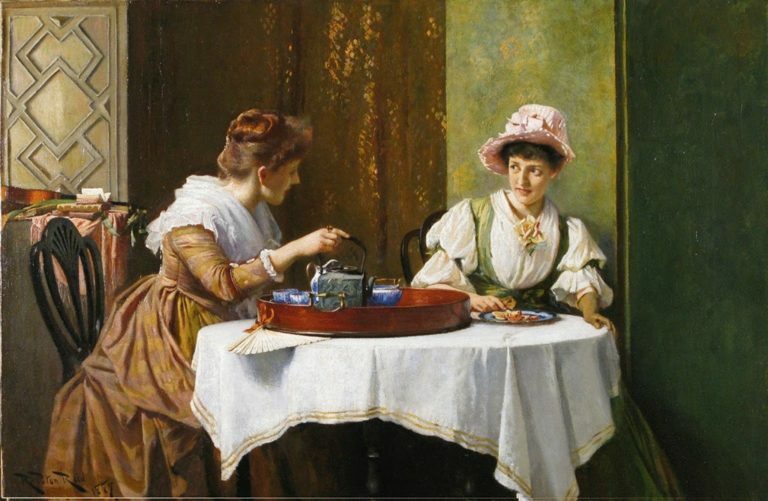 Although the practice started in High Society, it is not known as High Tea. Traditionally, High Tea or Meat Tea is a substantial, heartier meal served around 5pm at homes in Scotland, Wales and the North of England. 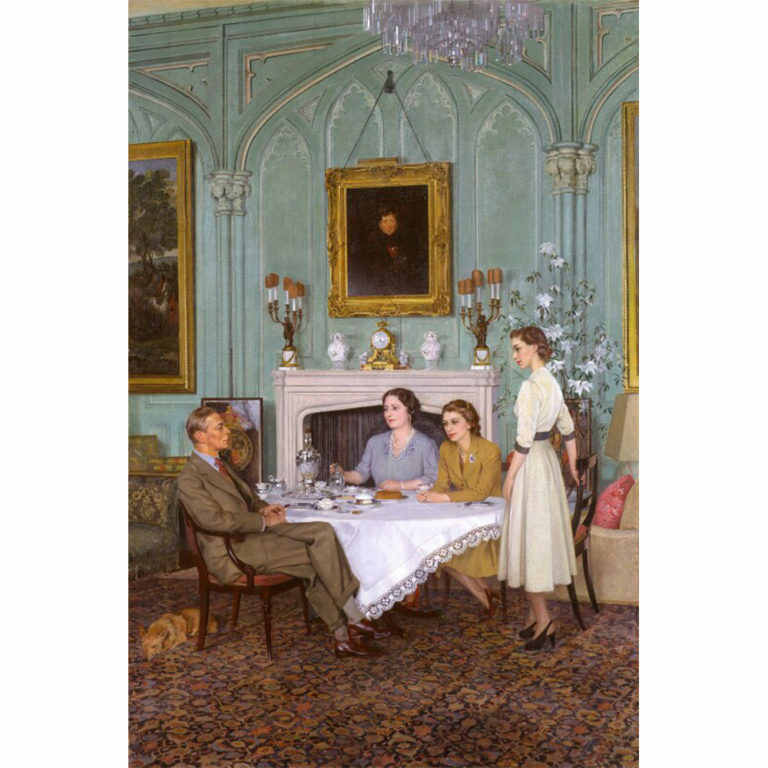 At the end of the working day, the family sits around a high table for their main meal as opposed to a lower tea table. In Britain today, people drink tea all the time from early morning until late at night. 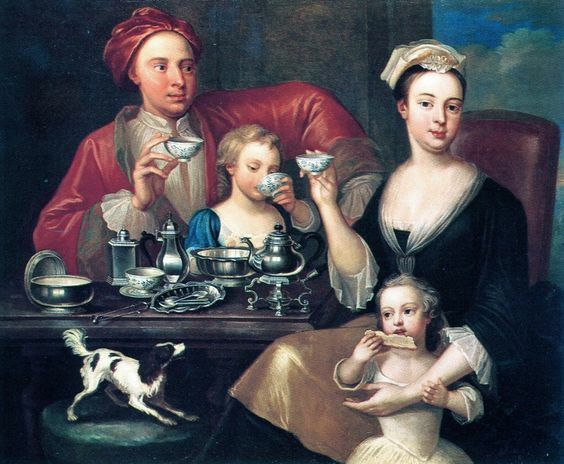 However, when tea was first imported to England from China in the 1600s, the exotic, luxury drink was consumed in pleasure gardens and coffee houses, predominantly male preserves. 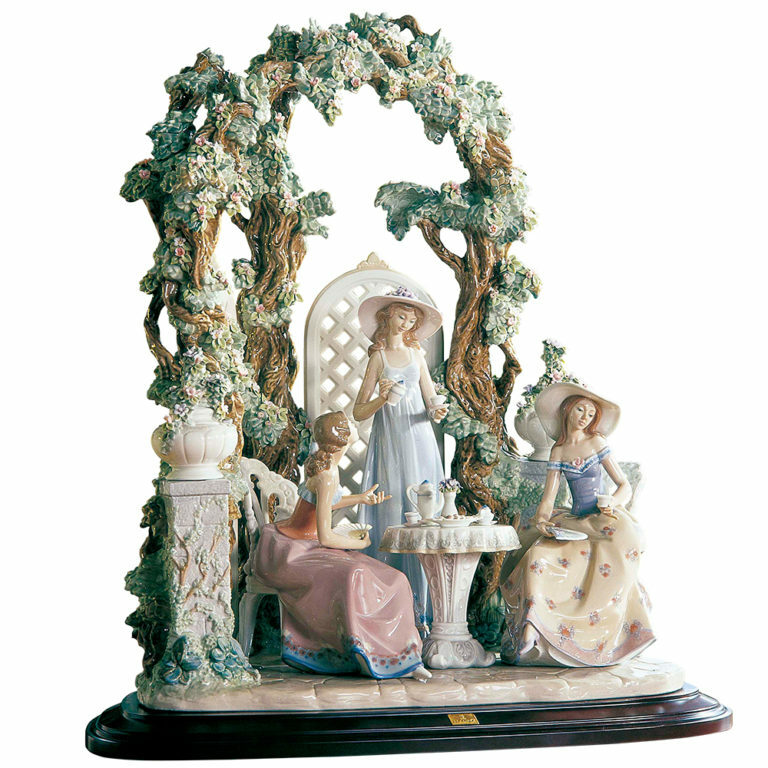 By the 18th century, the tea table was becoming a woman’s special place in the home. 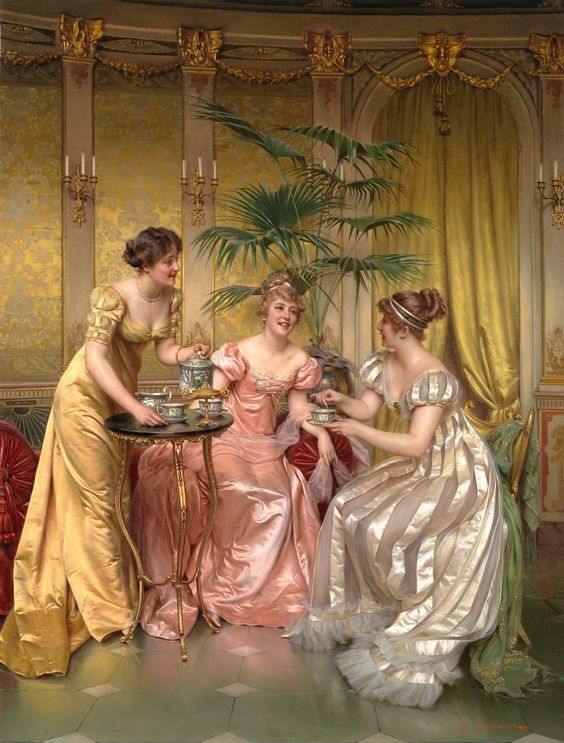 Tea was often drunk by ladies in the drawing room after retiring from the dinner table. The after-dinner tea ceremony displayed the family’s affluence as tea was very expensive – a pound of tea cost the average annual wage of a worker. 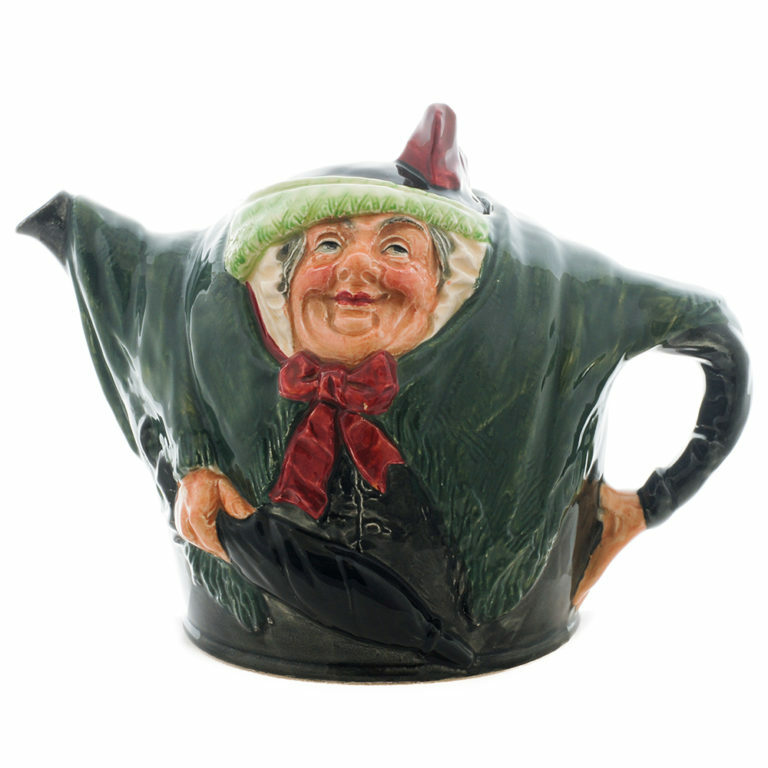 Not surprisingly, the lady of the house kept the key to her lockable tea caddy on a chatelaine around her waist. 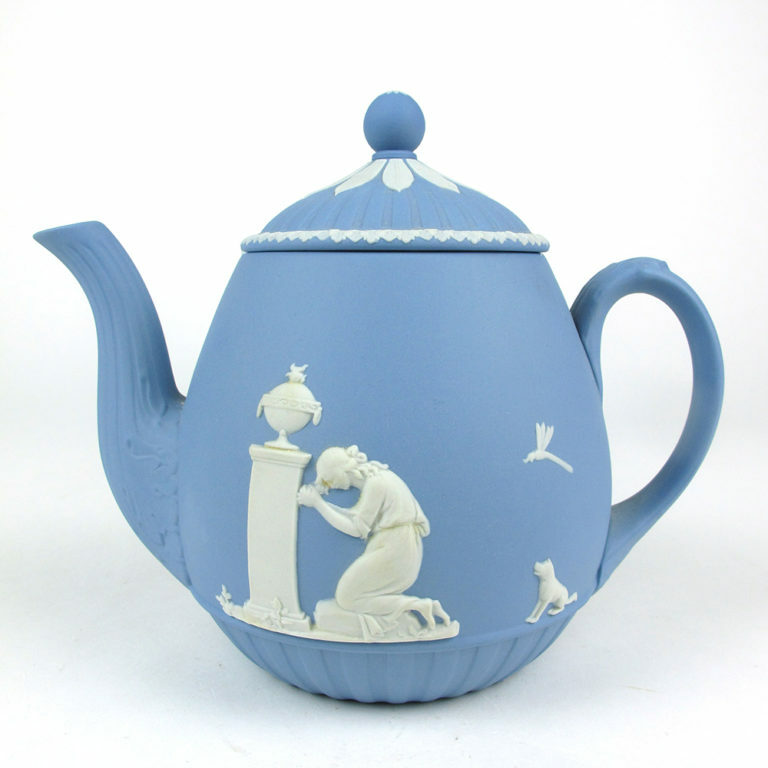 It was customary for aristocratic ladies to brew the tea as a ritual, not delegating the task to the servants. A French visitor noted after a visit to England in 1781. 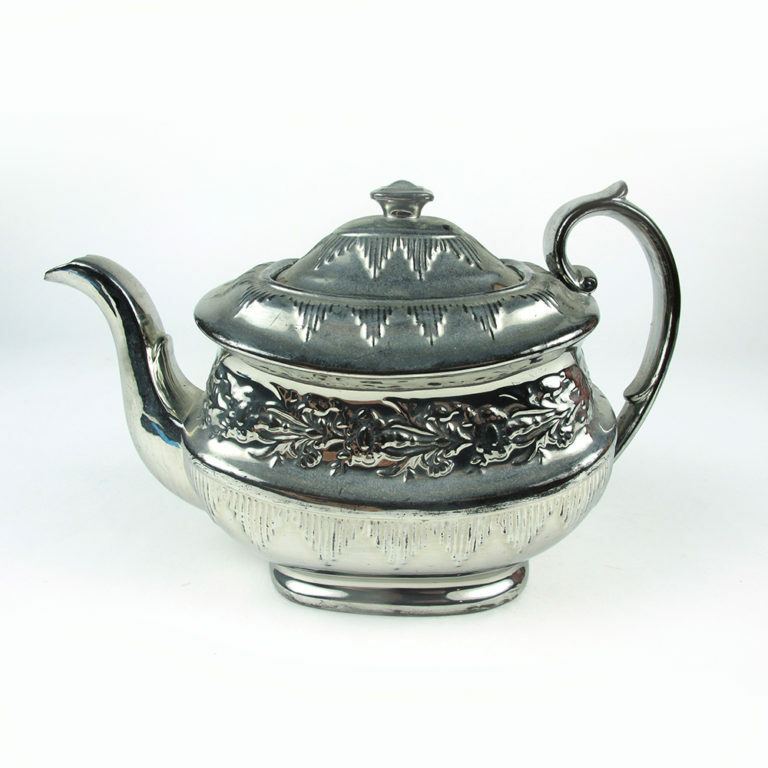 “The greatest mark of civility and welcome they can show you, is to invite you to drink tea with them.” Families flaunted their wealth with their elegant equipage, including silver teapots, sugar tongs and tea strainers. 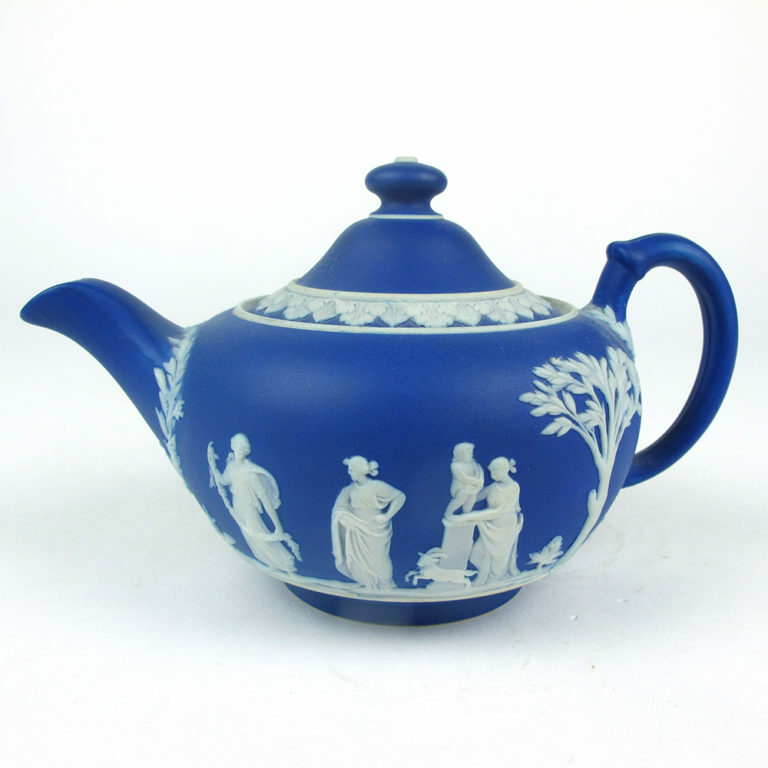 Porcelain tea wares were imported from China along with the tea but gradually the elegant equipage was provided by European manufacturers. 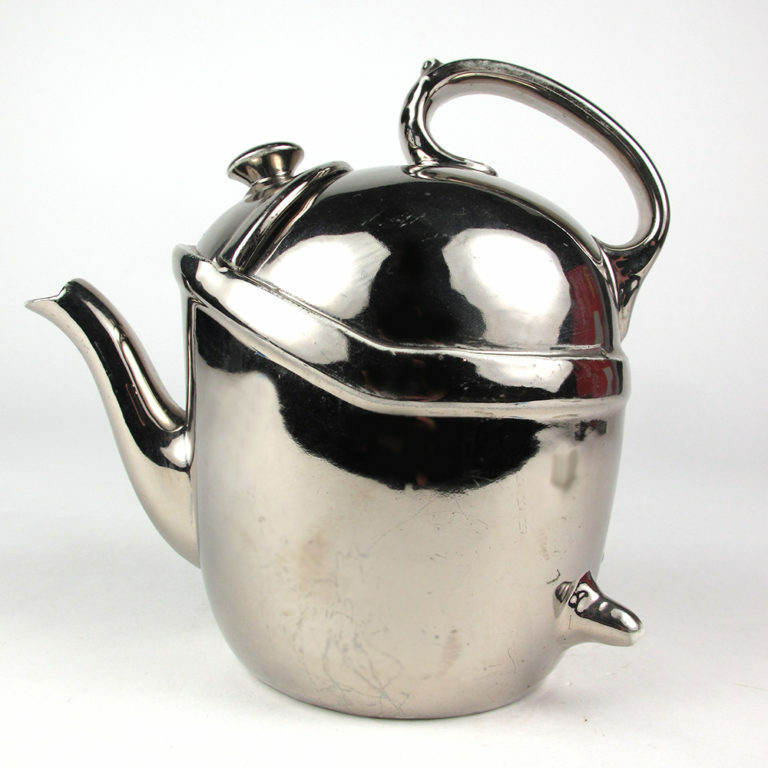 Silversmiths could easily add a spout to a teapot, but it was harder in pottery and porcelain. 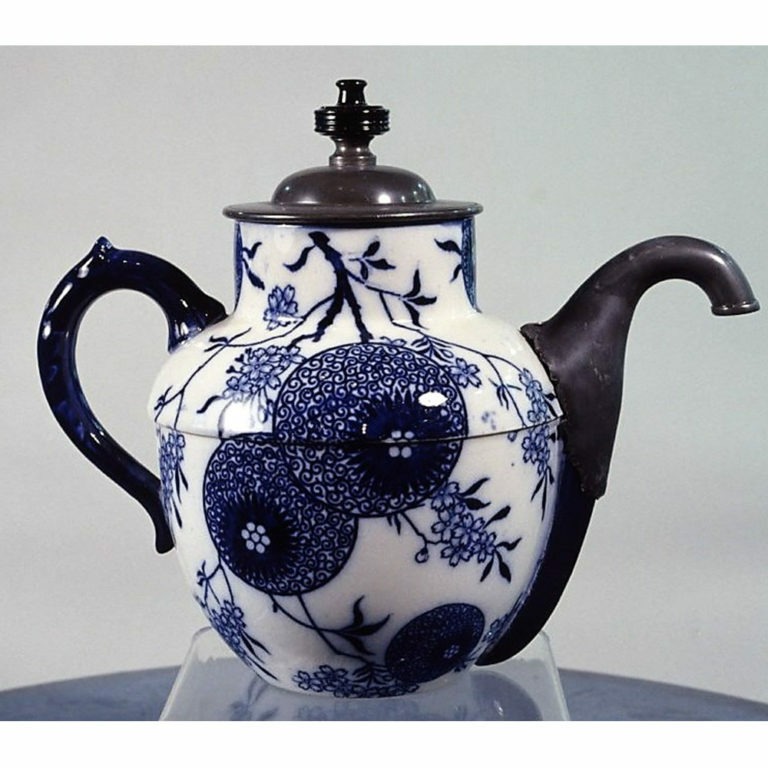 During the 18th century, British potters experimented to develop especially strong ceramic bodies to replace the Chinese imports. 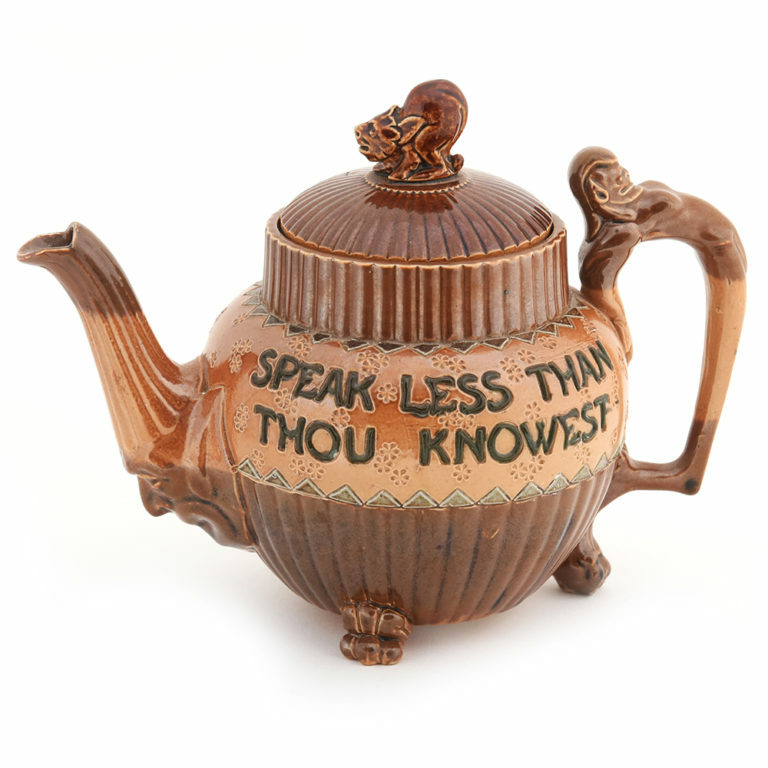 Josiah Wedgwood’s Basalt and Jasper ware teapots became very popular. 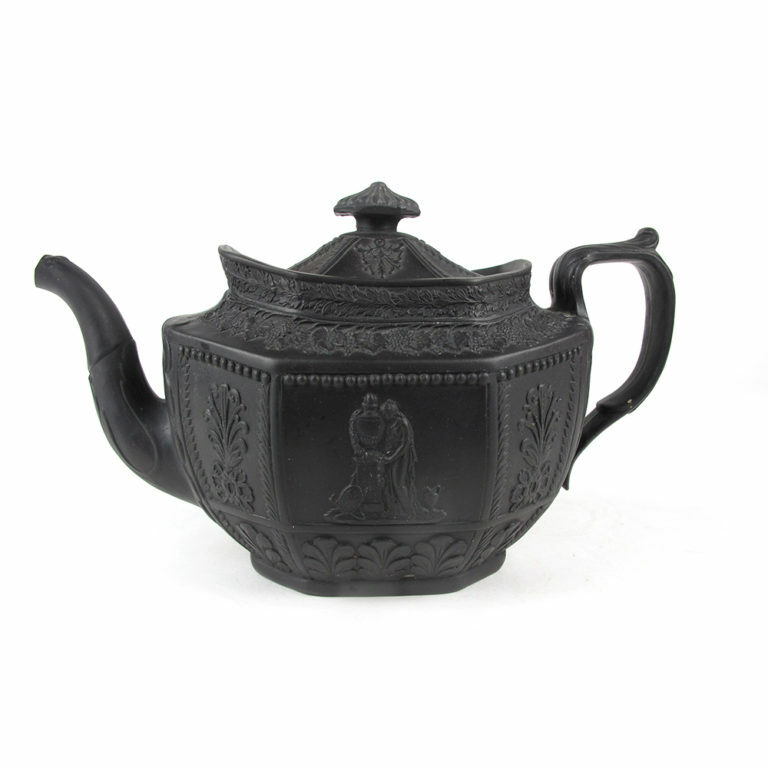 Black was a favorite color as it emphasized the whiteness of the hostess’s hand when pouring the tea by candlelight. 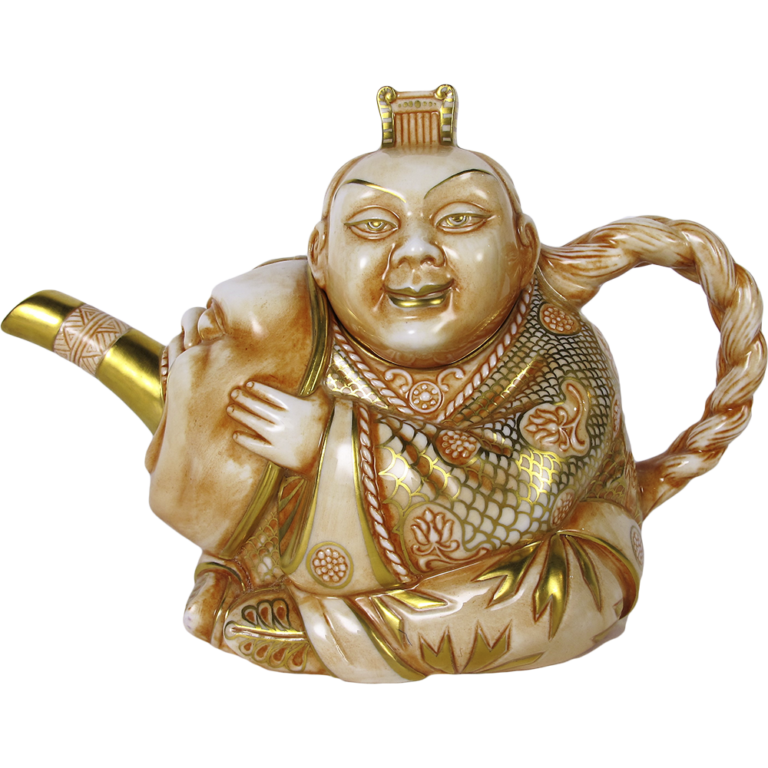 Initially tea was sipped in bowls without handles, as in China. Eventually European factories mastered the art of porcelain production and were able to make it strong enough to attach handles to teacups. By the way, the little ‘pinkie’ finger should not be up when holding the cup handle! 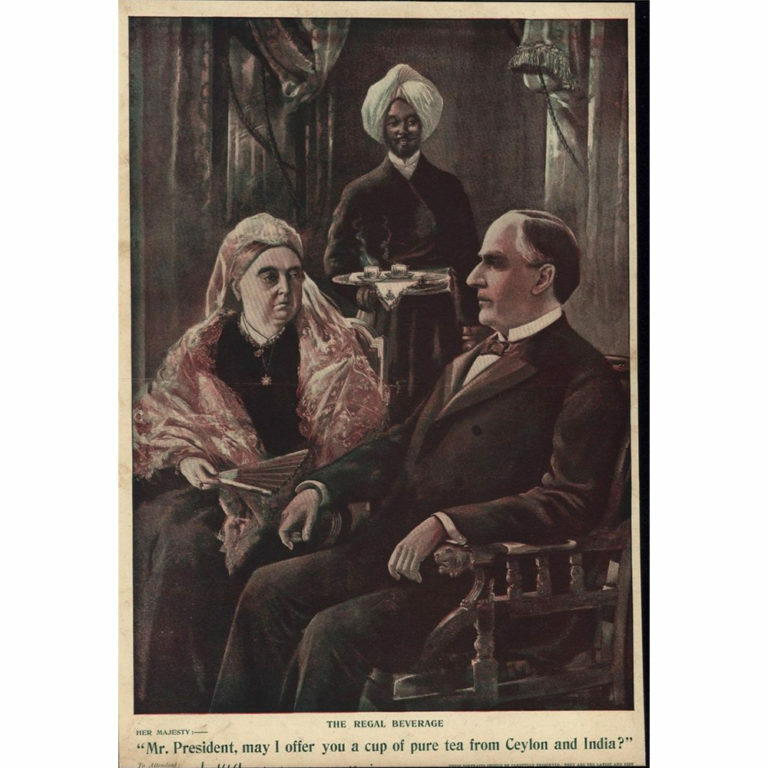 Tea eventually became more affordable in Britain during the 1830s, when the British tea plantations in India began to supply the growing taste. 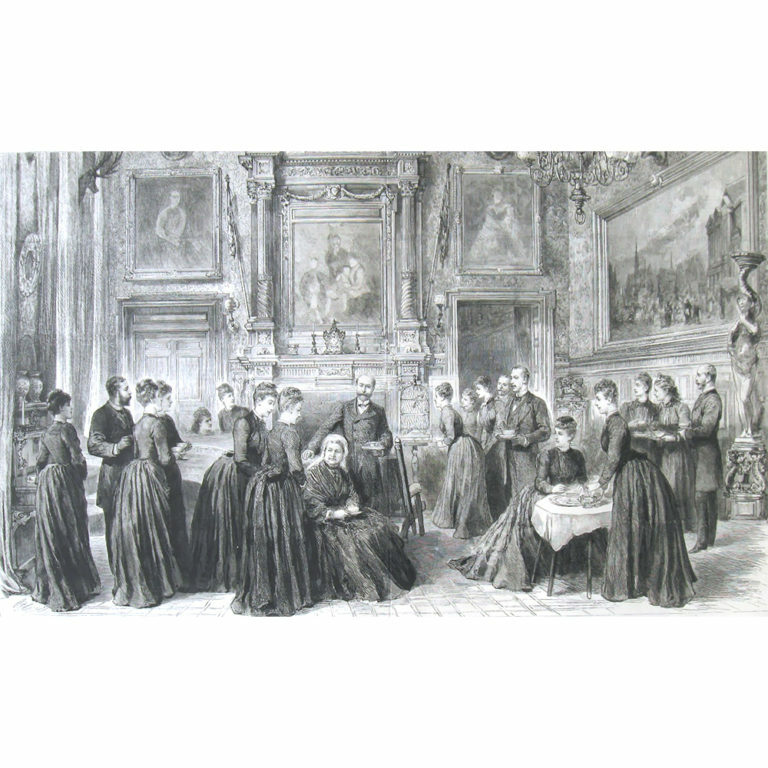 By the mid-19th century, the leisured classes were enjoying tea, sandwiches and cakes in the late afternoon to bridge the long gap in the day before formal dining at 9pm. 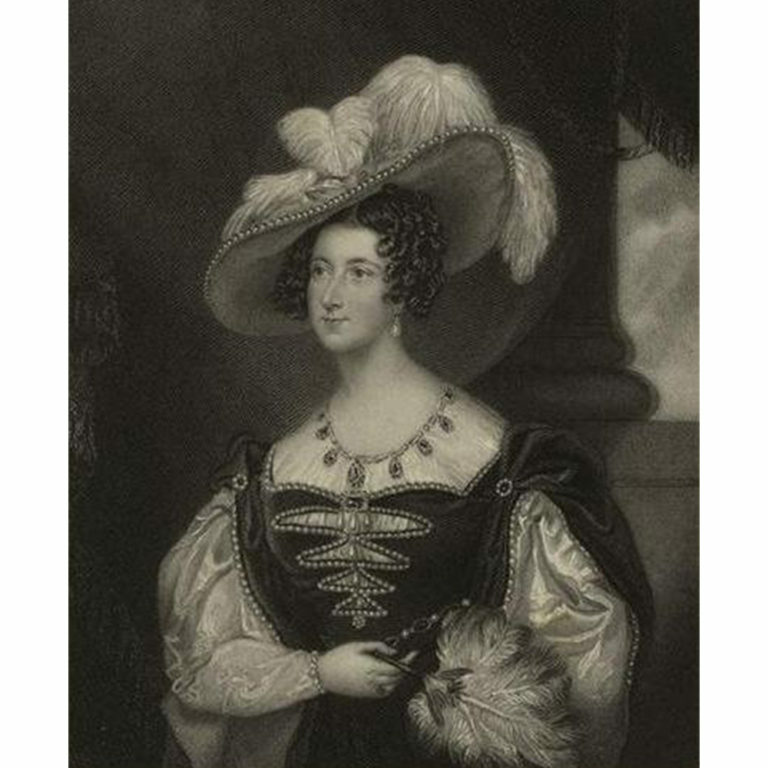 Anna Maria Russell, the Duchess of Bedford, is credited with starting the custom. 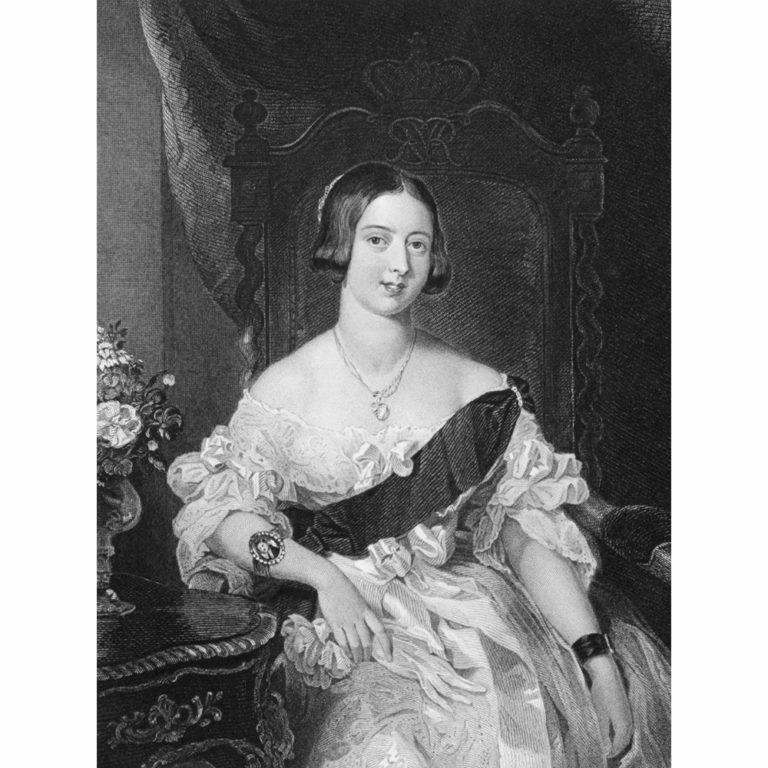 The Duchess was Queen Victoria’s Lady of the Bedchamber and a lifelong friend of the monarch. To counteract the ‘sinking feeling’ she experienced in the afternoon she began inviting friends to a light repast of tea and sandwiches. At her country home Woburn Abbey, guests were invited for tea and a tramp in the fields. When she returned to her London residence, she would send cards asking friends to join her for ‘tea’. Other society hostesses soon followed, and afternoon tea crystallized into a specific social event. Guests dressed especially for the occasion in elaborate tea gowns trimmed with lace, ruffles and ribbons. 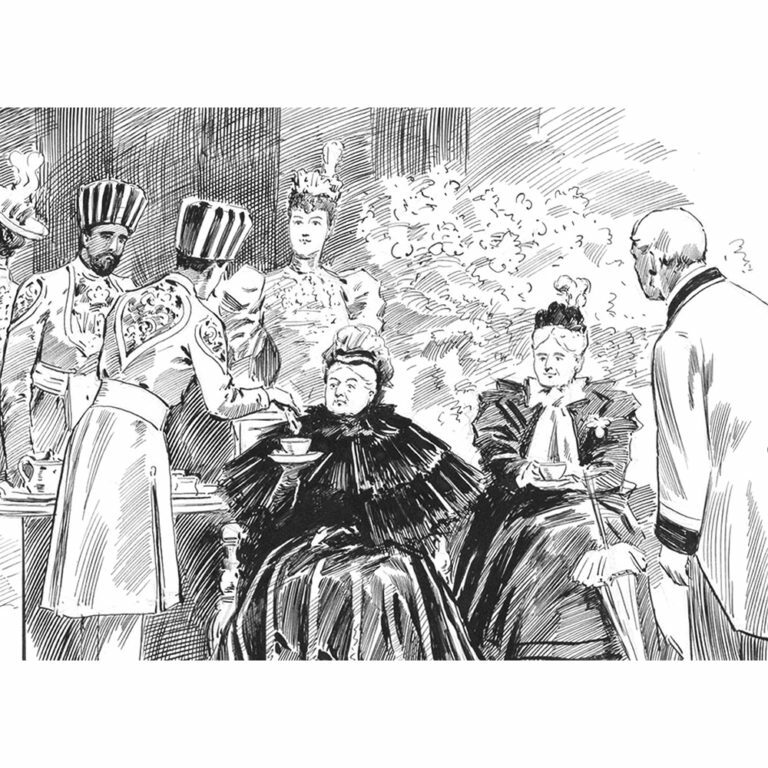 Queen Victoria enjoyed this new custom and hosted formal afternoon tea parties between 5pm and 7pm which allowed her guests time to change for dinner. Her tea of choice was Earl Grey, a China black tea infused with Oil of Begamot, which was served with her favorite shortbread biscuits. 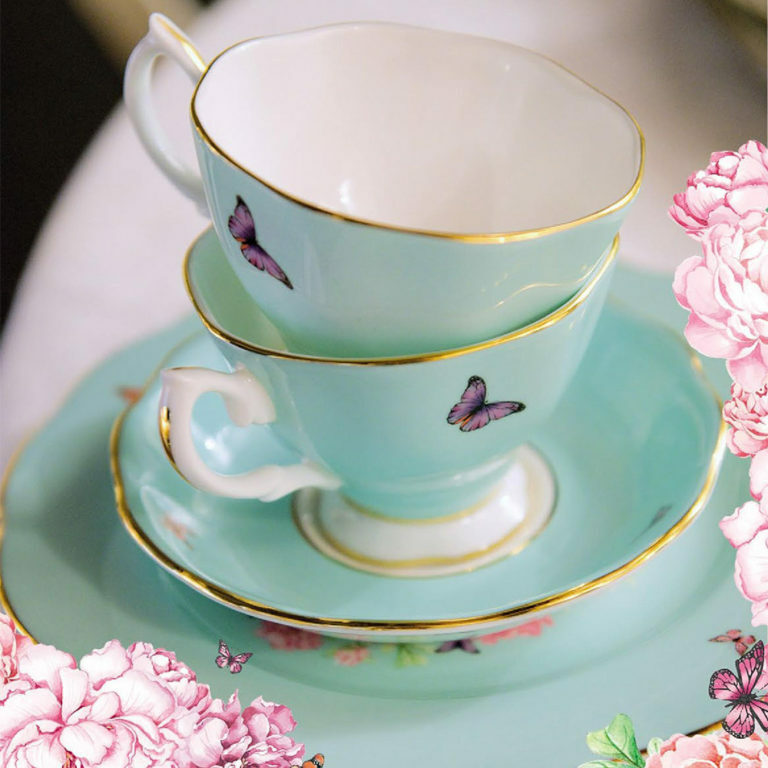 An apocryphal story tells that the Queen was such a tea fanatic that she would fling her tea cup across the room if the brew was not up to her standards! Apparently, Queen Elizabeth II also enjoys Earl Grey tea without milk or sugar in the morning before she gets out of bed. Queen Victoria enjoyed ‘taking the air’ in all weathers often to the chagrin of her friends and family. Tea was often served at these picnics as well as at formal lawn parties in fine weather. 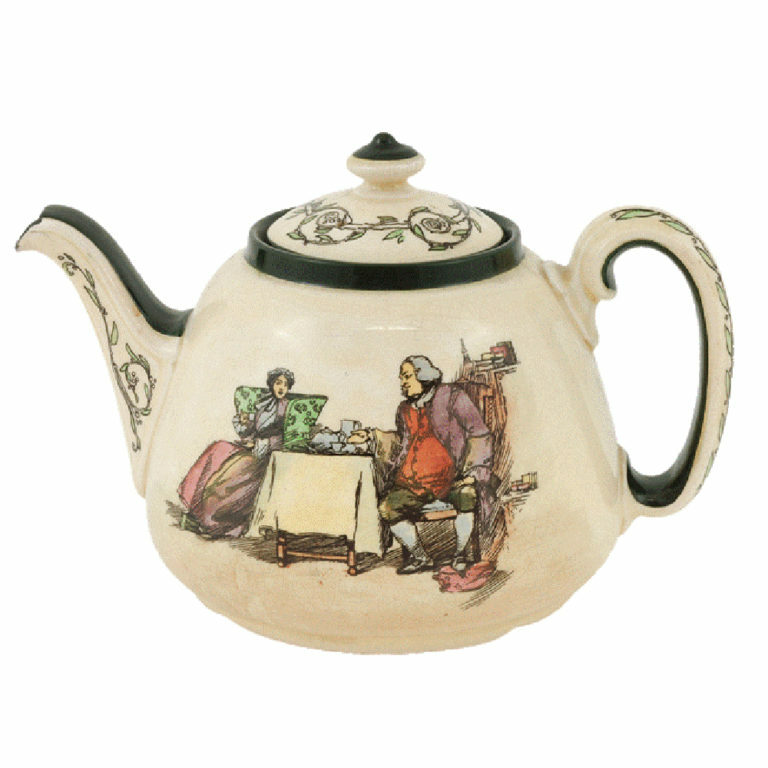 By the 19th century, the British potteries were producing all the accessories for a successful tea party. 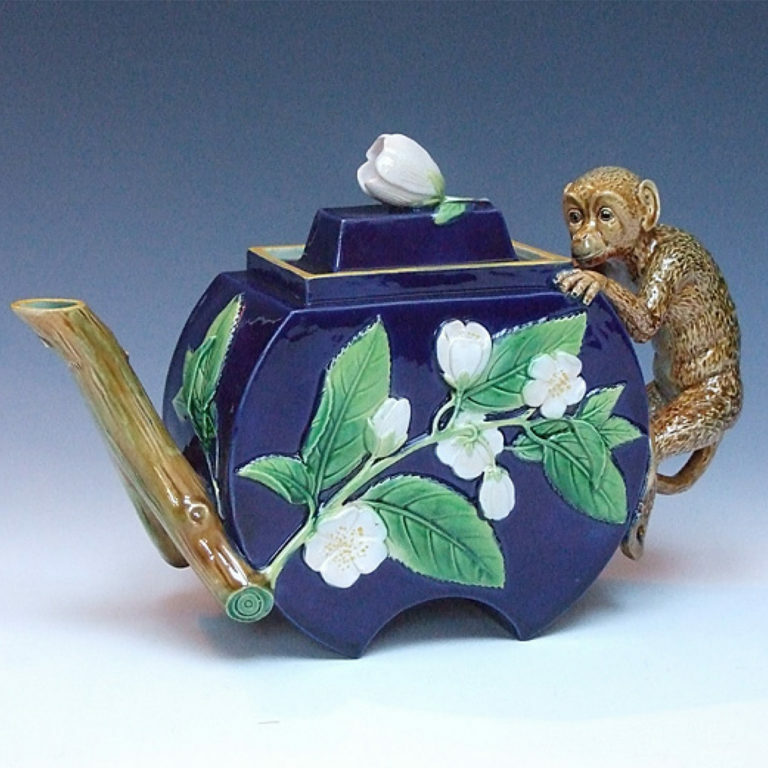 Whimsical Majolica teapots were entertaining conversation pieces. 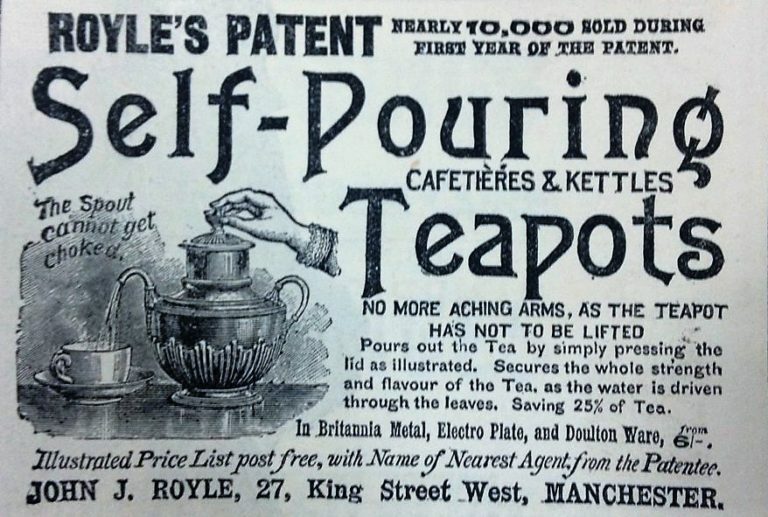 Ingenious patented inventions lightened the load, such as the Simple Yet Perfect tilting teapot and the Royles Self Pouring Teapot, which eliminated the drudgery of pouring tea with no more aching arms! 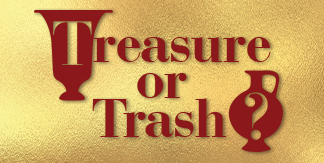 As used by Queen Victoria, the advertisements claimed. 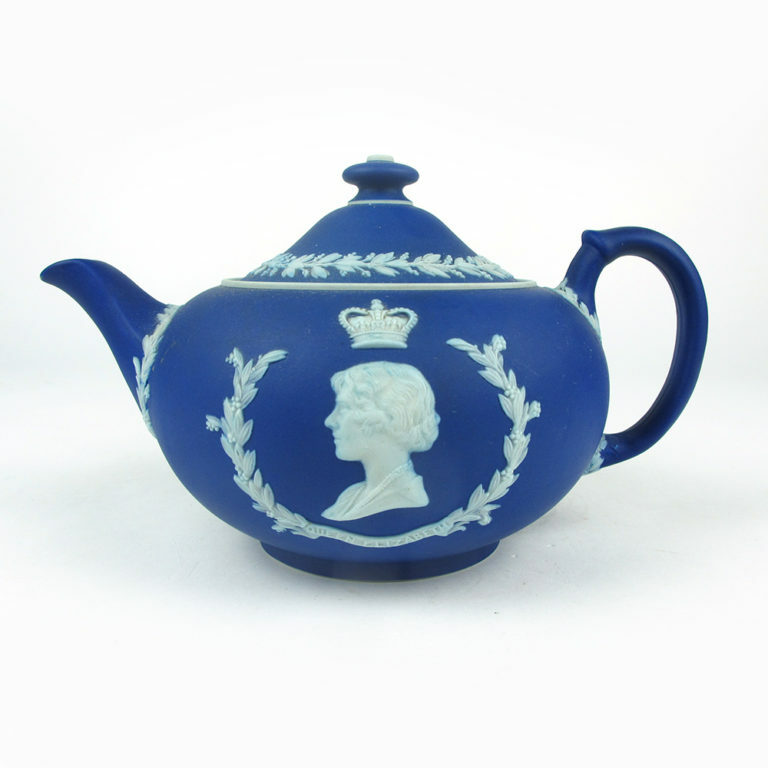 Ingenious patented inventions lightened the load, such as the Simple Yet Perfect tilting teapot and the Royles Self Pouring Teapot, as used by Queen Victoria according to the advertisements. 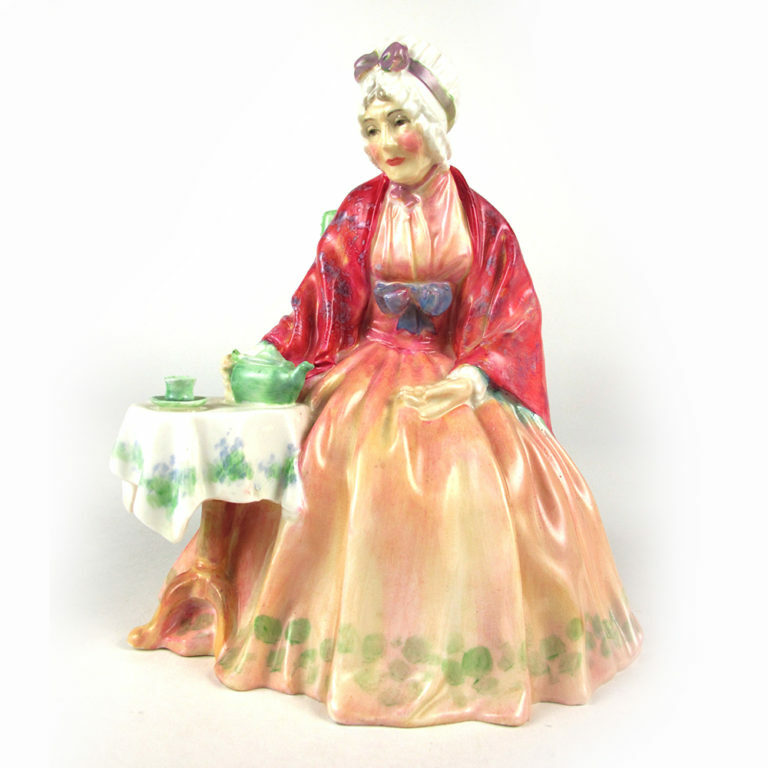 The image of the Queen was often used to endorse tea products and she appeared on countless commemorative and souvenir teapots when she died in 1901. 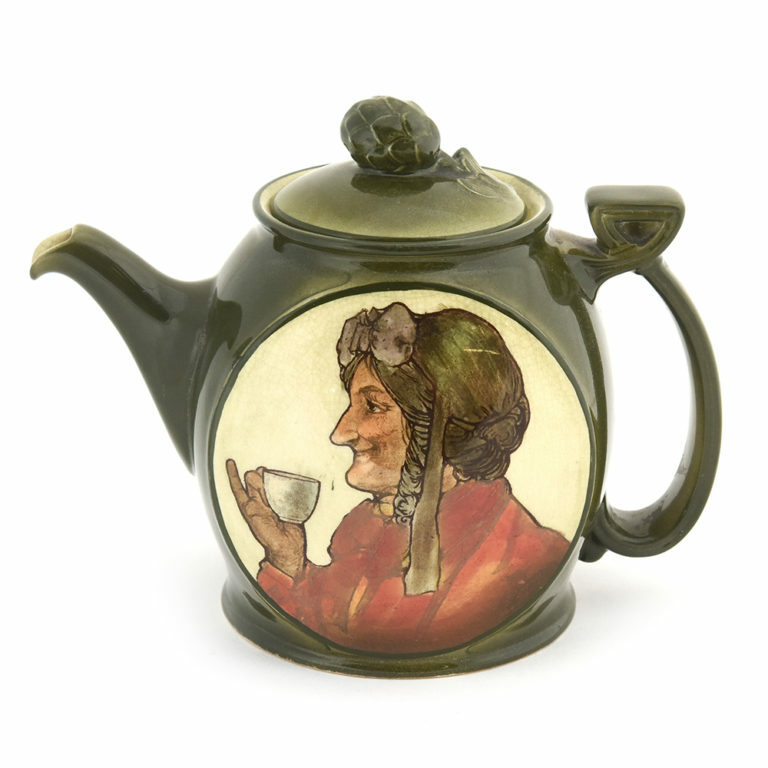 The vociferous campaigns of the temperance societies also helped to promote the beverage among all classes of society, advocating “The cup that cheers but not inebriates.” Tea drinking among ladies became so popular that some questioned whether drinking tea at home would lead to women gossiping too much or harm their health. 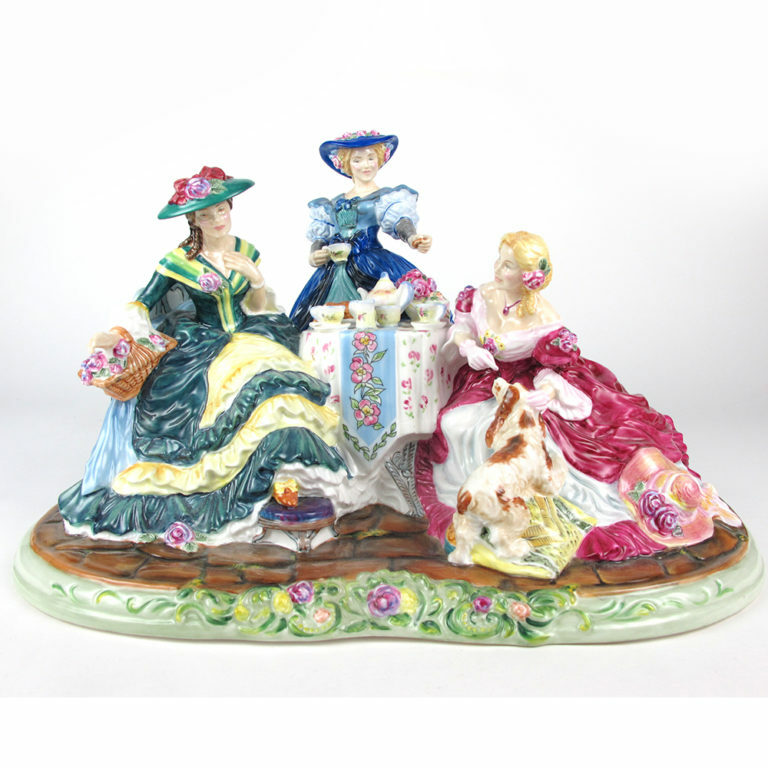 However, this did not stop the popularity of afternoon tea which spread from stately homes to tearooms around the country. 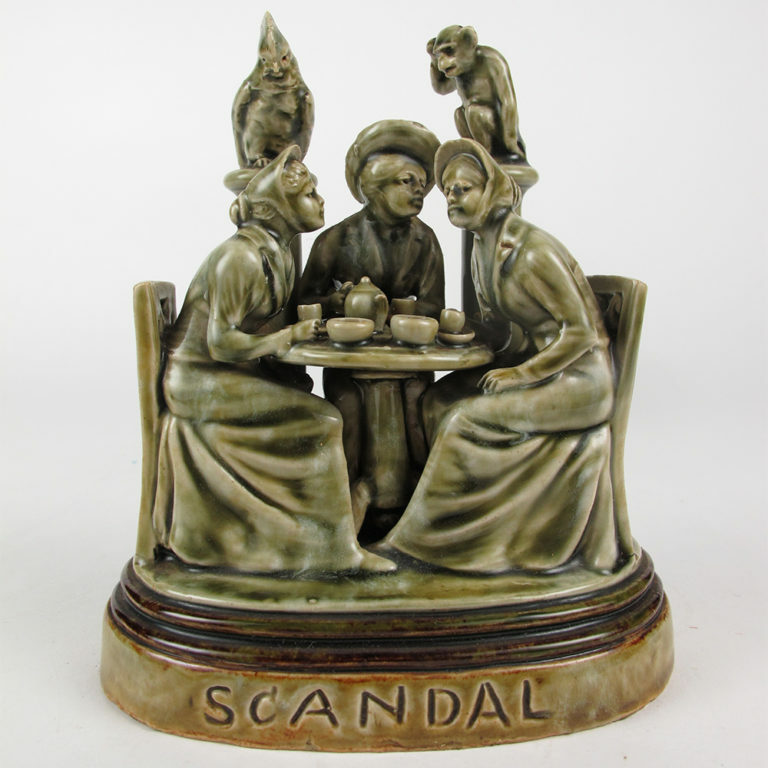 Women would congregate after a shopping excursion to enjoy a cup of tea and some good old-fashioned gossip. 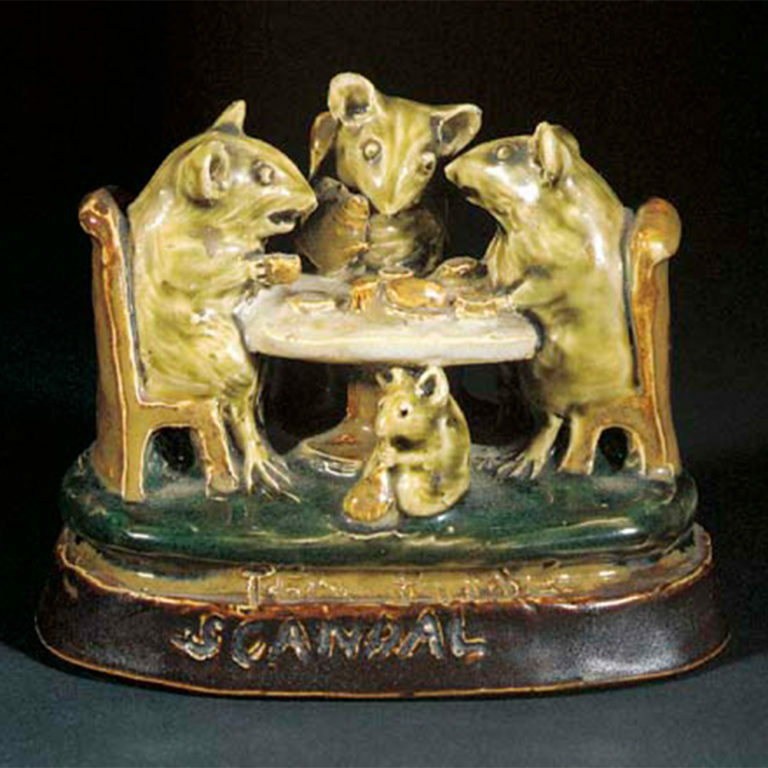 Doulton artist, George Tinworth, obviously observed the opportunity for scandal at these occasions as he modeled a group of ladies taking tea, reputedly Lady Doulton and friends, as well as their mouse counterparts. 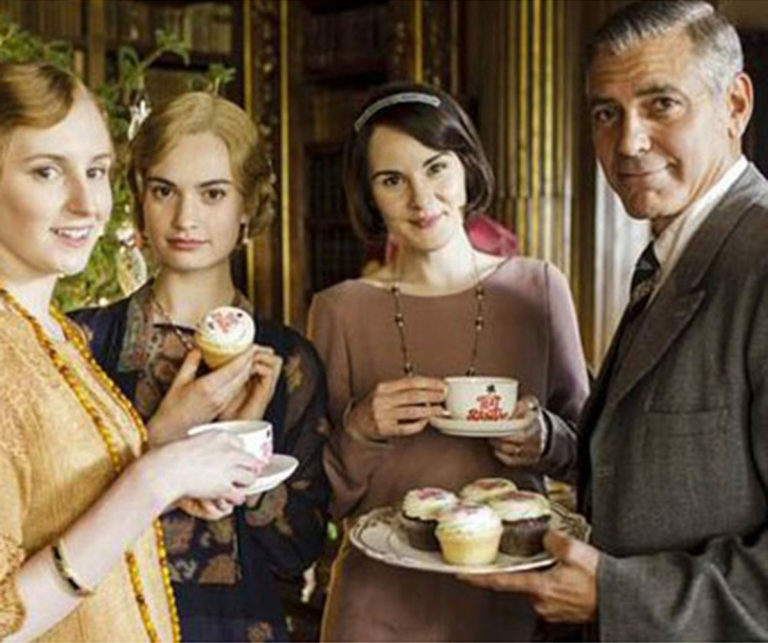 Fans of Downton Abbey have witnessed the intrigue and relationships of the Crawley family unfold at many elegant afternoon tea gatherings. 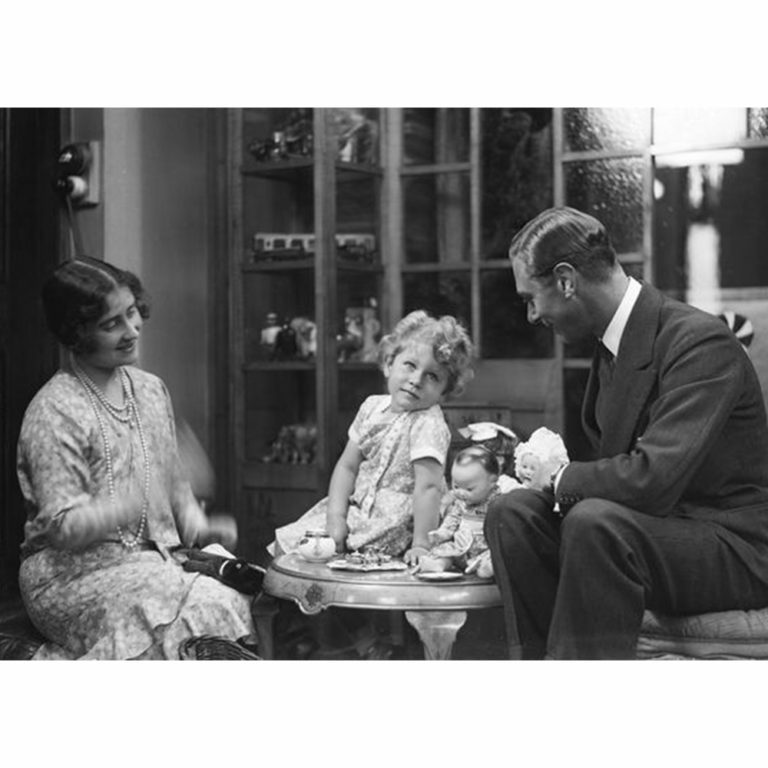 The entrancing picture of aristocratic life in Britain before the Great War has entranced viewers around the world. Now the Crawley family and their servants are endorsing their own brand of Downton Abbey teabags! 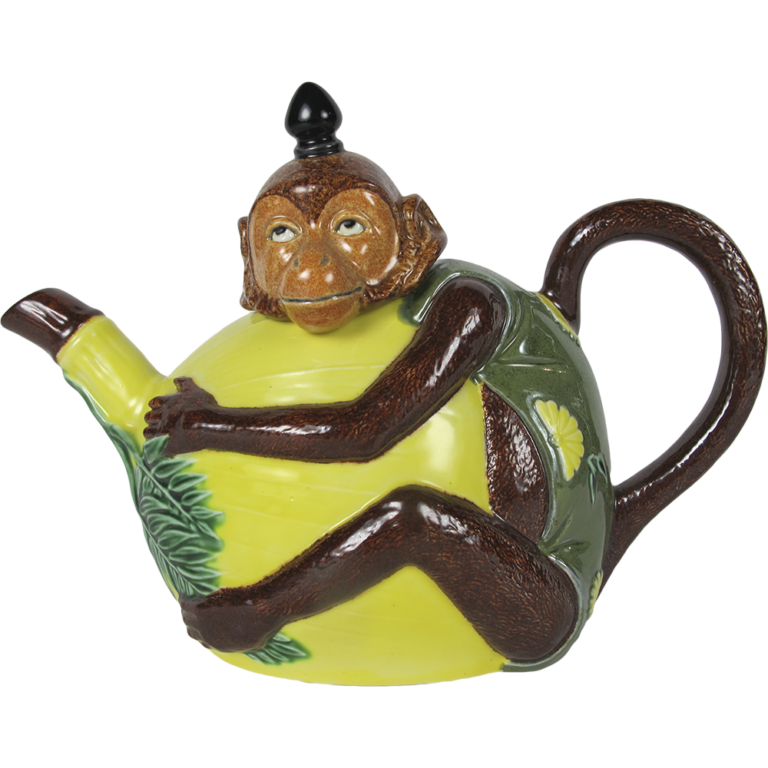 The convenience of a teabag compared to loose tea leaves was first discovered by an American tea merchant. Thomas Sullivan used a small silk purse to send samples of his blends to clients and discovered that they were simply dunking the bag into boiling water. 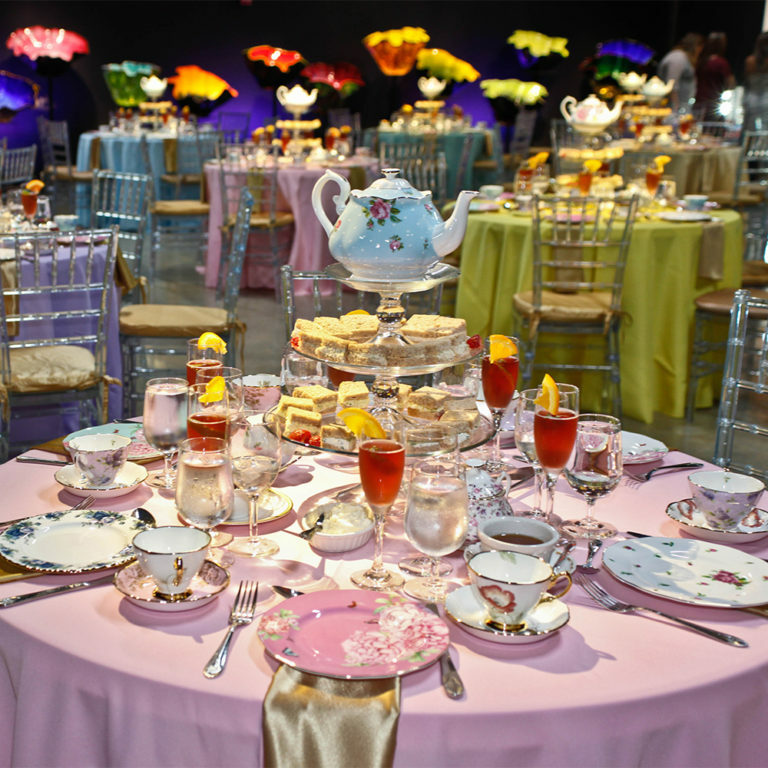 He patented the teabag in 1904, the same year that Americans first enjoyed the delights of iced tea to cool off during the scorching hot summer at the St. Louis International Exhibition.